With winter on the way, Grandfather Mountain is decking its halls — and hills — for the holidays. Visitors are invited to celebrate the season from a mile high, where they’ll encounter idyllic winter scenery, invigorating outdoor adventure and more at the Linville, N.C., nature park. Grandfather Mountain offers two simple ways to save on park admission during the holiday season. As a gesture of support for local tree farmers, anyone who arrives at the mountain with a tree atop their vehicle or a receipt from a local tree farm will receive $2 off each adult admission and $1 off each child admission. December also marks the return of Dollar Days for local residents. From Dec. 1-31, anyone who lives or works in Alleghany, Ashe, Avery, Mitchell, Watauga or Wilkes counties will be admitted to the mountain for only $3 per person, with proof of local employment or residency. In lieu of cash, Grandfather Mountain also will accept three cans of food from local residents for distribution to local food pantries. Christmas tree discounts may not be combined with Dollar Days discounts. Located in the Nature Museum and Top Shop, Grandfather Mountain’s gift shops carry a variety of artisan crafts and goods, as well as signature Grandfather Mountain souvenirs, from apparel to hiking gear to drinkware and all things in between. The shops, along with the mountain’s Entrance Gate, also offer Grandfather Mountain gift cards, which are applicable toward admission, souvenirs, food, fudge and more. Looking for a gift that’s warm and fuzzy? While Grandfather Mountain’s resident animals are not for sale, the Adopt-an-Animal program is the next best thing — and a lot less messy. The program allows participants to symbolically adopt any of Grandfather Mountain’s furry or feathered residents, including black bears, river otters, cougars, bald eagles, elk and more. By adopting an animal, individually or on behalf of a friend, family member or loved one, the sponsor will receive a special gift package. Gifts vary, depending on the donation level, and can include photographs, plush toys, plaster footprint castings, day passes and more. Visit www.grandfather.com/preserving-protecting/adopt-an-animal/ to learn more. 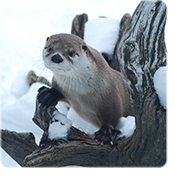 Make an animal’s season merry and bright by treating them to gift items and enrichments. An enrichment is a special treat or toy designed to break up the animals’ routines and help keep them active and intellectually stimulated. To see what the animals are wanting this holiday season, visit their Amazon.com wish list at http://amzn.to/1Qr6gfU. For more information, email habitats@grandfather.com. Treat your favorite animal lover to an up-close-and-personal experience with Grandfather’s resident animals. The Keeper for a Day program provides a unique opportunity to spend a half-day shadowing and working alongside the keepers of Grandfather Mountain’s environmental wildlife habitats, observing various training sessions, animal behavior and the inner workings of the park’s habitats. Keeper for a Day runs April through October, but reservations are accepted year-round. To learn more, email habitats@grandfather.com. The views aren’t the sweetest thing on Grandfather Mountain. 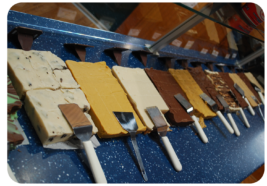 The mountain is also home to a sustainably operated fudge shop, which boasts a colorful variety of homemade, delectable and seasonal flavors. Although the shop is only open on weekends from January to spring, fudge will be for sale daily in Mildred’s Grill, located in the Nature Museum. Fudge is also only a phone call away. Orders can be placed for pickup or home delivery by calling (828) 733-6518 or (828) 733-1058. For a gift that keeps on giving, shoppers can purchase an annual membership to Grandfather Mountain’s Bridge Club. Starting at $30 for children and $70 for adults, Bridge Club membership offers unlimited, free admission to Grandfather Mountain for a year, exclusive discounts on and off the mountain, invitations to special member programs, a Bridge Club car decal and more. Group passes are also available. To learn more, visit www.grandfather.com/plan-your-visit/hours-and-rates/annual-passes/. Ring in an epic New Year on Grandfather Mountain with the first sunrise of 2019. On Tuesday, Jan. 1, the mountain will host another New Year’s Sunrise event, offering guests the chance to start off their new year on a literal high note. Sunrise is at 7:38 a.m. Jan. 1, 2019, and Grandfather’s gates will open at 6:30 a.m. Due to safety regulations, participants may only visit the Mile High Swinging Bridge area, including the Top Shop, during the event. To help warm up on a likely cold winter’s morning, the mountain will offer complimentary coffee, cocoa and bearclaws for sunrise guests. Admission to the New Year’s sunrise opportunity costs $15, in addition to general admission, meaning $35 for adults and $24 for children. Guests are free to remain in the park all day, but those who leave before 9:30 a.m. will have their general admission charge refunded. 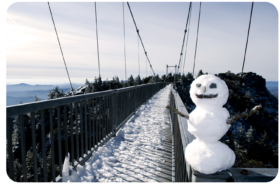 Bridge Club members, who receive free admission to the mountain, will only pay $10 for the sunrise event. The event is open to no more than 100 participants, and registration is required. To register, contact Judi Sawyer at judi@grandfather.com or (828) 733-2013. The New Year’s Sunrise is contingent upon the weather and road conditions. All registered participants will be notified if the event is canceled. Grandfather Mountain is owned and operated by the Grandfather Mountain Stewardship Foundation, a nonprofit organization whose mission is to inspire conservation of the natural world by helping guests explore, understand and value the wonders of Grandfather Mountain. All of the park’s funding is derived from admission, souvenir sales, food and beverage sales and donations, 100 percent of which goes right back into the mountain, ensuring its pristine beauty is preserved for generations to come. Those hoping to contribute in theirs or someone else’s name may do so by visiting https://grandfather.com/donate-to-preserve-grandfather/, which allows them to sponsor a particular project or donate to a cause of their choosing. Grandfather Mountain is open daily throughout winter, weather permitting, except for Thanksgiving and Christmas. When winter weather arrives, visitors are encouraged to call the Entrance Gate at (828) 733-4337 to confirm the day’s conditions and set the stage for a memorable outing. The not-for-profit Grandfather Mountain Stewardship Foundation strives to inspire conservation of the natural world by helping guests explore, understand and value the wonders of Grandfather Mountain. For more information, call (800) 468-7325.